We just spent several days out of town visiting family and getting to know my newest nephew, Jackson. He is my sister’s first baby and loves to snuggle. The girls had such fun holding him that it was difficult for me to get a turn! 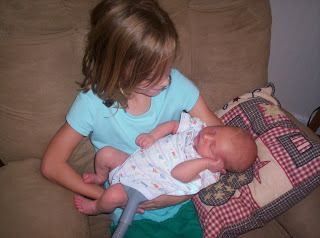 He had to wear a bilirubin blanket for several days due to jaundice, but was able to take it off on Friday. He’s a beautiful baby and we’re so happy to celebrate a new family member!We got to enjoy a touch of fall weather while we were away. 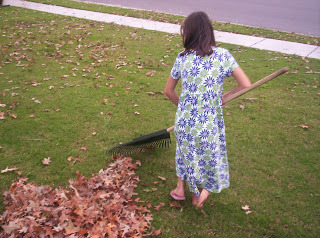 It definitely wasn’t as cool when we got home, but we did have a scattering of leaves in the yard. 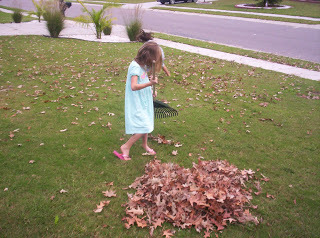 The girls decided to rake up a pile of them to jump in! They actually worked at it pretty hard; it was a great way for them to burn off some of their energy after being in the car for most of the day. Now if we could just get those cooler temperatures to head our way! What a cute little baby Jackson is! The weather is beautiful here today. Our high is not even supposed to be 75 degrees…..nice breeze blowing. I love it!